Home » Food » Snippets: Top Tables for your Reunion Dinner this Chinese New Year 2019 | Best Chinese Restaurants in Singapore, and more! Yes, we just celebrated the New Year, and we are already starting our countdown to the Year of the PIG! Considering how unsatisfactory the Dog year has been for the Pandas, we are glad it is coming to an end real soon! Before that, here’s our pick of the top Chinese restaurants in town you should consider having your reunion dinner! Panda’s Pick: Make sure you go for the Snow Crab Yu Sheng (S$88) instead of the usual Yu Sheng with Salmon. For the mains, opt for the Sauteed Coral Clam with Jumbo Asparagus and XO Chilli Sauce and the Steamed Marble Goby, Chopped Chilli and Minced Garlic in your set menu. With the bright colours and great flavours for both dishes, ensuring a delightful reunion. Panda’s Pick: In the year of the Pig, Jade introduces pork based dishes into their set menu, and it was worth all the efforts. Make very sure you have their Pork Tripe Soup with Hennessy X.O. Cognac, this nourishing soup stole the attention of the table and fellow diners were all praised for it. And if you have seen our instagram feed, make sure you order a portion of the Crispy Suckling Piglet Skin with Caviar. Another startling take by Jade, the skin was very on point with its crisp and jus, coupled with the tender meats and toppled with a generous cope of caviar, what’s not to like about this? Panda’s Pick: Another Chinese restaurant that took the traditional Suckling Pig and gave it a twist – well, it is the year of the Pig! Their rendition, Roast Suckling Pig stuffed with fragrant Coconut Rice, took inspiration from Singapore’s favourite local Nasi Lemak Rice and Otah. The result is a match made in heaven, with the pandan flavoured glutinous rice taking in the fragrant pig jus and a well roasted suckling pig. Another dish, the Eight Treasure Congee is a a hearty option for the carbs selection here, with eight local small dishes topping the congee while served. Top points for a hearty and comforting mains this Chinese New Year. 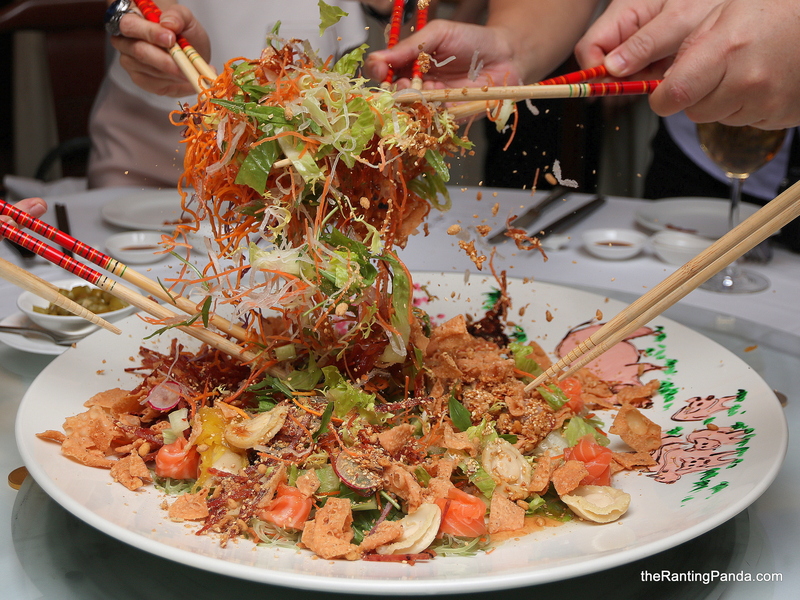 Panda’s Pick: For the folks going for the most luxe set menu at Pan Pacific Singapore’s Hai Tien Lo, at S$688.80 per person, make very sure you pre-order for the Piglet-inspired Yu Sheng – which frankly is one of the cutest Pig Yu Sheng in town this year. With a new chef on board, Hai Tien Lo introduced a couple of new ala carte dim sum selections including their Diced Chicken and Mushrooms Crispy Pastry Tart accompanied with Abalone; impress your fellow diners this Chinese New Year. Panda’s Pick: Definitely taken aback by the Roasted Pork Belly Roulade with Minced Seafood at Man Fu Yuan. The soft, yet crisp, skin of the roasted pork belly, went perfect with the sweet minced seafood. Doubt the restaurant meant for this dish to be a start of the dinner here, but it stole our hearts for sure. Another interesting take at Man Fu Yuan is its Herbal Chicken in Lotus Leaf. Chicken meats are rolled up into a ball, with thick herbal sauce drizzled atop. Enjoy the strong aroma of the Chinese herbs once you cut into the chicken, giving a multi-sensory element to the dish. Panda’s Pick: With one Michelin Star, Summer Pavilion is perhaps one highly sought after Chinese New Year dining destination in Singapore. Every meal the pandas had here, has never disappointed. Two highlights from the menu this year are surprisingly both soup dishes. The first being the Australian Lobster Soup, complete with asparagus, carrot and egg white. The clear lobster broth was sweet and intense, yet not overpowering when savoured with the other light ingredients in the soup. Another take of the chef’s childhood dish, the Poached Iberico Pork Glutinous Rice Dumpling is a savoury ‘tang yuan’ with pork and mushroom fillings in superior stock. Panda’s Pick: The Wan Hao Imperial Pot of Prosperity Pen Cai with Crispy Oyster, Braised Irish Duck, Pig Trotter and Black Moss Dace Fish Paste is one of the most indulgent and sumptuous Pen Cai this year. With ingredients including the Australian 3- head Abalone and the Irish Duck amongst many, hopefully this will usher in a year of abundance for you. Another highlight is the Deep-fried Lobster with Passionfruit Mayonnaise & Cereal. A refreshing take, with fellow diners agreeing this is one dish worth craving for. Panda’s Pick: Racines has always impressed with being more than just a French restaurant, with its kitchen being able to execute Chinese fare very well. For this Chinese New Year, Racines introduces two mains which you ought to be trying, including the Baked Caramelised Black Cod Fillet with Soy Glaze and the Claypot Royale Braised Duck with Sea Cucumber. Like how the restaurant manages to break through the traditional method and ways of presenting Chinese food, and for the rebels, this is the restaurant for you. Panda’s Pick: For that lohei to start every reunion meal, we were impressed by Madame Fan’s Prosperity Yu Sheng ($88 for small, $128 for large) most amongst the many meals at Chinese restaurants this CNY season. More savoury than sweet, ingredients including crispy rice noodles, purple cabbage and silver fish, the Yu Sheng is a good start to the meal. Another favourite here is the Charcoal Grilled Wagyu with Foie Gras. The thick slices of Foie Gras will easily be mistaken as fried tofu, although one bite into the foie gras with the wagyu cuts, this is a perfect oriental take of what’s a rather French food. Panda’s Pick: Nothing beats savouring soups in a Cantonese restaurant, let alone enjoying this in a Michelin-starred restaurant. The Double-boiled Superior Bird’s Nest with Fish Maw and Chinese Cabbage is deservingly the highlight of any meal here. Paired this up with the Braised Boston Lobster in Superior Stock, and your meal here will be perfect. Panda’s Pick: Yan Ting does not disappoint. From its top notch service, to a kitchen that has constantly been amongst my top favourite Chinese restaurants in Singapore. This CNY, go for their Braised Fish Maw with Fresh Crab Meat in Superior Sauce, this thick soup was well executed with the entire table going quiet as we savoured the richness of this Cantonese soup. Another highlight at Yan Ting is the Signature Yan Ting Pun Choy. Unlike most other restaurants, the pen cai at here is individually plated into a mini claypot. The attention to details that elevates dining experiences here, has always made Yan Ting a standout. Panda’s Pick: Nothing beats having your reunion dinner with hotpot, and if you are a fan of Beauty in The Pot, you just might bump into one-half of the Pandas whom will also be enjoying his family’s reunion dinner on the eve here. Make sure you go for their Beauty Collagen Broth, nothing else matters. If you are looking for take-out options, Paradise Group has introduced the Bountiful Takeaway Set ($298 for Paradise Members and $328 for public) which consist of an Abalone Yu Sheng (for 10 pax), Treasure Box (for 5 pax), Fortune Lotus Leaf Glutinous Rice and the Black Truffle Kampung Chicken. Panda’s Pick: Try the “Do-It-Yourself” Popiah Set, ideal for four diners, where you make your own popiah according to your own preference. Some of the fillings served are the hand-shredded turnip, bamboo shoot, pork belly cooked in prawn and pork stock, along with condiments like fried garlic, chilli paste and crabmeat and prawn. The large popiah skin has a strong egg flavour to it, which is delicious. Our other pick is the Sayur Kailo with Pork Ribs, which spots a rich and flavourful curry and tender pork ribs, along with Moringa pods. Panda’s Pick: Go for Yan’s Signature Roast Crispy Suckling Pig, and if you are going for a more interesting take, go for the Suckling Pig Carved Shoulder and Oven-baked Pig Fillet with Lemongrass. Trust Yan to know how to get you the crisp skin and tender juicy pork. Another mains you ought to enjoy here at Yan is the Steamed Half Lobster with 18 years Nu Er Hong Rice Wine. Nu Er Hong is added when the steamed lobster is done, giving it that punchy notes; and you get to enjoy a small serving of Nu Er Hong by itself on the side. Panda’s Pick: Go for their flagship outlet, Crystal Jade Palace, for its Pan-seared Lobster with XO Sauce topped on Yuzu Noodle. Our love for Yuzu is known, but it is perhaps our first to savour the lightly Yuzu-flavoured noodles done with savouries. The outcome is a very light, yet delightful, ending to the usually heavy reunion meal. If you are looking for Pen Cai this year to take home for your gathering at home, Crystal Jade will be retailing their Bountiful Abalone Treasure Pot (S$268.80 for small, S$468.80 for large) at all their outlets. The Pen Cai here consist of 18 ingredients, including highlights such as whole 10-head Abalone, Sea Cucumber, Fish Maw, Scallop, Prawn, Dried Oyster and Pig Trotter! Panda’s Pick: Who would have thought a French bakery will be amongst Singapore’s most forward thinking patisserie, and we are excited with their Chinese New Year’s offerings. Making a return, the Queen’s Yusheng (S$88) will have diners crack through the golden chocolate egg and enjoy the sweet yusheng with a mix of chocolates, nuts, mandarin orange butter cake, meringue, yam and sweet potato chips, and fruits. The alter ego of Antoinette, the Pang’s Hakka Delicacies will also be offering take-out options. Go for their Hakka Abacus Seeds ($8 for 250g, $30 for 1kg, +10% surcharge during CNY), perhaps one of the best rendtion of this traditional snack available.